Completely change up your next salad by simply chopping up some brussels sprouts! 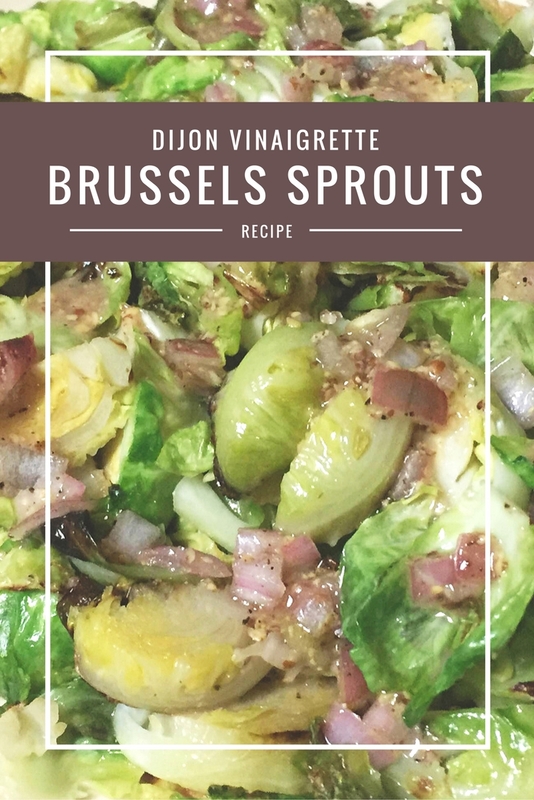 Brussels Sprouts are one of my favorite vegetables, and I am always trying new ways to prepare them. Most of the recipes involve them whole or halved, but have you ever tried them all chopped up? 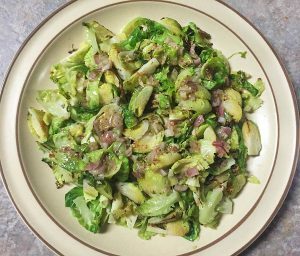 Lately I’ve been quartering brussels sprouts to toss as a salad instead- it completely changes them! Just like any salad there are tons of possibilities for add-ins and dressings, but for this one I chose to stay simple. A salad with minimal ingredients doesn’t have to be boring though! I combine this dish with a homemade dijon vinaigrette that makes it very memorable. 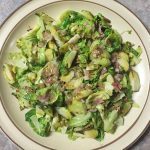 Chopped brussels sprouts with dijon vinaigrette is a perfectly uncomplicated way to make a full-flavored salad or side dish. I started by slicing all of the brussels sprouts (make sure you cut the end with the stem off first), then prepping the pan. Heat up a bit of oil and when ready, sauté the chopped brussels. While they are cooking on the stovetop prep the dressing. Pour both olive oil and red wine vinegar together in a bowl, add in some salt and pepper and stir. Throw in some minced shallot and mix with dijon mustard until all is well blended. That’s it! Such a quick dressing to throw together but it has intensely good flavor. When the sprouts are tender remove from heat and pour the homemade salad dressing over the top. Stir and serve- it’s that easy! Chopped Brussels Sprouts with homemade dijon vinaigrette dressing. 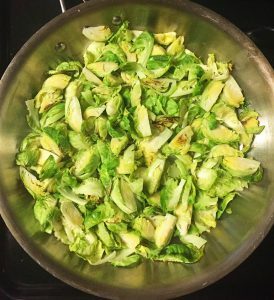 Cut the ends off of the brussels sprouts and quarter them. Heat up a bit of oil in a skillet over the stove. When ready, sauté the chopped brussels (About 5-7 minutes). Prepare the dressing while the sprouts cook. Pour the vinegar and oil together in a bowl and stir until well mixed. Add in some minced shallot, the mustard and the seasonings. Once the sprouts are tender remove from heat and pour the dressing over them. Serve it up! Walnuts would be a great addition! 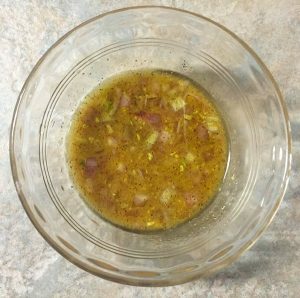 I personally liked this dressing so much that I made it three times in one week! I picked it up from one of my Blue Apron meals for an arugula salad. You can check out my thoughts on that food delivery service on my post about my experience. I’m sure I will be looking into other homemade dressings now that I learned this one, especially because I know EXACTLY what is going into it. Once you make something like this it makes it hard to go back to buying a bottle of dressing the next time you are at the store! Now that I am making my own salad dressings I will be looking into getting one of these for storage! >>This can be a Whole30 APPROVED recipe! Make sure there is no added sugar in the red wine vinegar used and you MUST use regular mustard, as dijon is not on the list for Whole30 items that you can have.